Apply for the AP EAMCET Notification 2019, which was released by the officials of the Andhra Pradesh State Council of Higher Education at the official website @ www.apsche.org on 20.02.2019. So, students who are very eager to apply for this Andhra Pradesh EAMCET Notification, those ones can apply from the recommended site from 26th February to 27th March 2019 without any late fee. Here on this web page, we have uploaded the full information about the AP EAMCET 2019 Notification. So, candidates to get the download links of the AP EAMCET Application Form, once observe the whole page by scroll down the web page, then you can get the detailed credentials about this notification. AP EAMCET Notification 2019 Released ! Latest Update On (26th February 2019): AP EAMCET Detailed Notification 2019 is Released and the Application Forms is activated. The Andhra Pradesh EAMCET Notification details are uploaded on this web page. 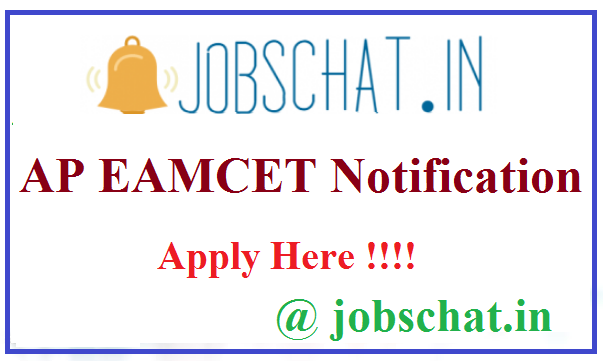 So, candidates who searching the internet for the purpose of the get the details of the AP EAMCET Notification 2019, those ones just refer this web page @ www.jobschat.in and get all the whole details. Those are eligibility, starting and ending dates of the notification, age limit, application fee, and more other details. So, students who are interested to apply for this AP EAMCET 2019 Notification, those ones must go through the mentioned eligibility conditions and apply for the notification, if you are eligible. Students who have completed the 10+2 or Intermediate, those ones can eligible to apply for this AP EAMCET Notification 2019. For the sake of all the willing candidates, the higher authorities of the Andhra Pradesh State Council of Higher Education has released the exam dates i.e 20th to 22nd April 2019. So, candidates who are willing to apply for this Andhra Pradesh EAMCET Notification, those ones just click on the mentioned on the below table and get the AP EAMCET Application Form. But candidates make sure submit the application form before the last date of the application process. Applying students must and should have passed in the 10+2 or Intermediate from the recognized board or university. Candidates remember one thing, you have to submit the Andhra Pradesh EAMCET Application Form through the online process. For the sake of all the eligible ones, we have uploaded the direct link on this web page. So, visitors just click on the highlighted link on this web page and get the AP EAMCET Application Form in a very simple manner. Candidates while applying for the AP EAMCET Notification 2019, make sure to avoid the fake details. Because it will be the effect on the future application process. Addition to this, candidates also catch the details of the Andhra Pradesh Government Job details, by just referring to the mentioned link on this web page. After the completion of the intermediate, most of the candidates very willing to apply for the AP EAMCET Notification 2019. Because based on the marks obtained in that written exam, candidates will select the best university or dream university for their further studies. So, candidates take this wonderful chance and apply for the Andhra Pradesh EAMCET Notification with the help of the mentioned links on this web page. Don’t worry about the download links of the Andhra Pradesh EAMCET Application Form, which are available on this web page. Notification Download Here NEW !! !